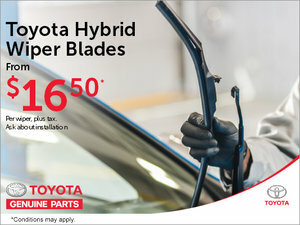 High-quality Toyota service can be found at Bank Street Toyota in Ottawa. Bank Street Toyota is dedicated to providing you with the very best service experience in Ottawa. That is why our team of service advisors and highly-trained technicians make every effort to exceed your expectations at every visit. Our Toyota services include a state-of-the-art maintenance and repair department staffed by experienced technicians and service consultants who will treat your vehicle as if it belonged to them. We also offer our clients a complete inventory of genuine Toyota parts and accessories that help improve the versatility or style of your vehicle, regardless of the model or year. Finally, our detailing and body shop center will have your car looking brand new, either by thoroughly washing and waxing it or by getting rid of those pesky bumps and scratches. As you wait for your vehicle, relax in Bank Street Toyota's beautiful waiting lounge complete with free wireless access and complimentary refreshments. To make things a little easier for you, we offer our clients the possibility of booking their service appointment online by using our contact form. We will contact you as soon as we receive your request. You can also contact us directly at 1 855 217-7044.